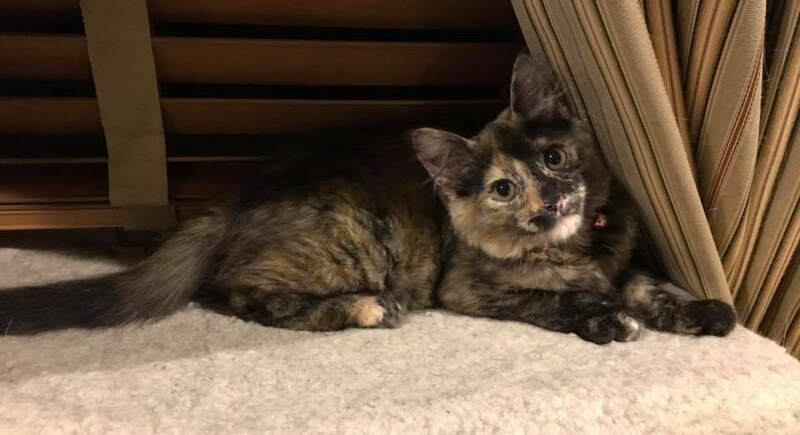 Enchilada is a feisty tortoiseshell who was taking her mother's warnings about humans to heart...until she met a foster mom with a warm lap and a brush. She ~loves~ being brushed. Enchilada has discovered the joys of snuggling and being cared for, and it makes her purr with everything she has! She loves to lay over her foster mom's heart, and just snuggle herself to sleep. She gets along well with other cats, dogs, and is doing wonderfully with the people she's met so far! Enchilada needs to be a second (or third) pet, due to her very sociable and playful natures. She's very unhappy as a solo pet! Because she's a fancy fluffy lady, her foster mom has been taking her to No Barks About It, to get used to above and beyond grooming care. She's doing so well!